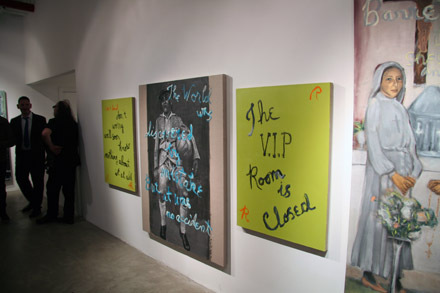 Installation view of Rene Ricard’s “Sonnets from the Portuguese”. All images Ian Hassett for Art Observed. 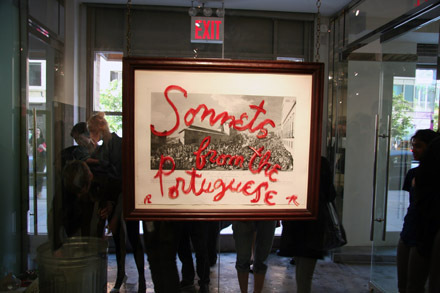 AO was on-site for the opening of Rene Ricard‘s “Sonnets from the Portuguese,” presented by Vito Schnabel at the former Heidi Cho Gallery in Chelsea. This is the artist’s first solo painting show in over twenty years, and features paintings overlaid with sharp, evocative poems written by Ricard. The show is entitled “Sonnets from the Portuguese” after a book by Elizabeth Barrett Browning, and is meant to “show [his] affection for the city of Lisbon.” It features sixteen canvases painted in basic “poison” green with short poems, and larger works featuring images based on those culled from family photo albums of Ricard’s friends, similarly painted over with text. 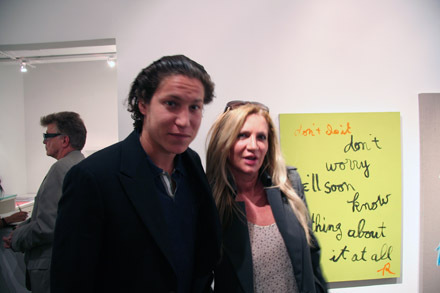 Dealer Vito Schnabel and friend. 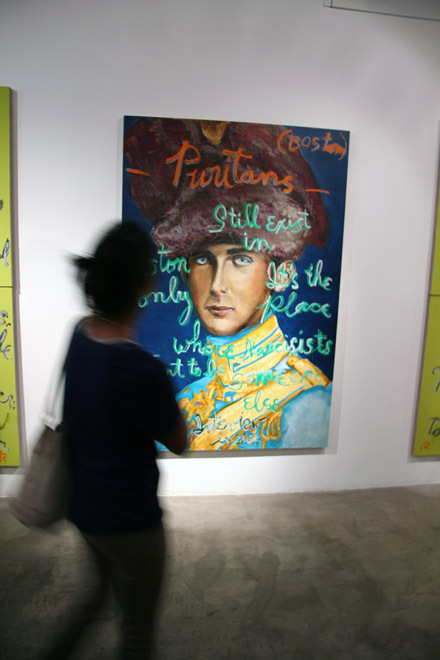 Though he has recently gained attention for his paintings, drawings and prints, throughout most of his career Rene Ricard was best known as a poet and critic. He became a downtown fixture at a young age, starring in Warhol films such as Kitchen (1965) and Chelsea Girls (1966) and collaborating with artists such as Nan Goldin and Francesco Clemente. After allegedly launching the careers of Julian Schnabel and Jean-Michel Basquiat, it seems fitting that Schnabel son Vito, called an “art-market prodigy” by the New York Times, has returned the favor by presenting a comprehensive exhibition of Ricard’s recent paintings. 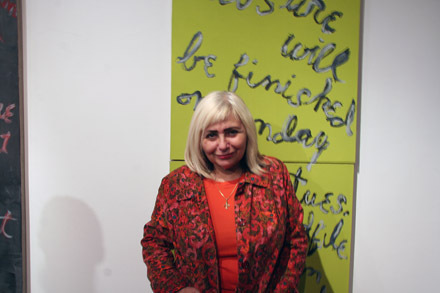 Ricard is represented in New York by Cheim and Read, and has shown at Half Gallery. His work “Boat” is currently sold as a limited reproduction though edition website Exhibition A. 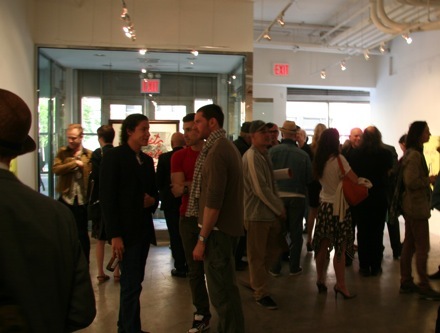 The show is located at 522 West 23rd Street. 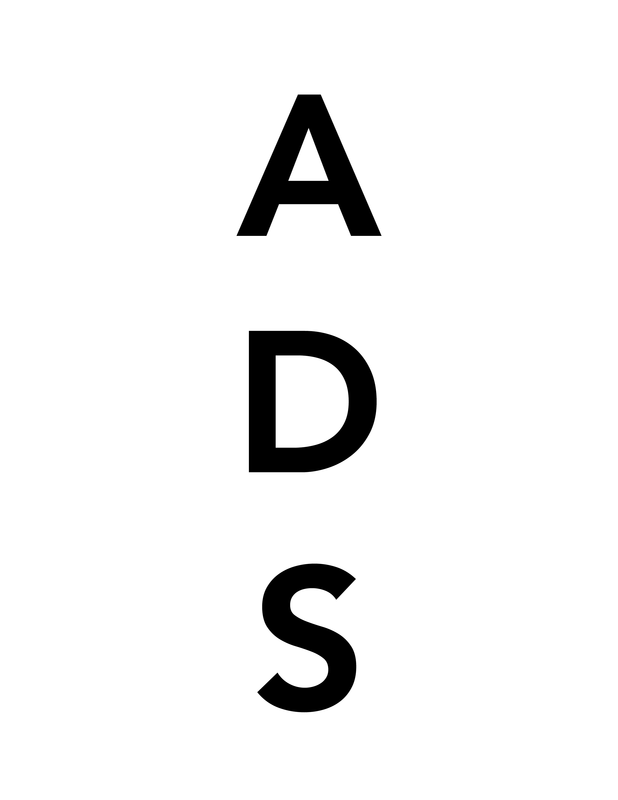 This entry was posted on Wednesday, May 18th, 2011 at 1:40 am	and is filed under AO On Site. You can follow any responses to this entry through the RSS 2.0 feed. You can leave a response, or trackback from your own site.